It’s hard to forget the Pathfinder we’ve all grown to love; it was one of the original body on frame truck like SUV’s that could trump any terrain and carry 7 adventure seekers at any given time. It was your true Sport Utility Vehicle. But now those days are long gone… the Pathfinder has simply crossed over into, well… a Crossover. And in 2013 Nissan introduce the fully redesigned Pathfinder, that’s geared more for the Urban Jungle Soccer Mom rather than the Amazon Jungle. When redesigning the Pathfinder, Nissan started with the Infiniti JX35 and simplified it. The new Pathfinder is nothing like the previous generation adding smoother lines and less of an attitude. The only true muscular exterior feature would be the large chrome grille. Nissan spared no expense offering us this 2014 Pathfinder Platinum edition coated in Arctic Blue Metallic paint. This newest design has been giving me mixed feelings. 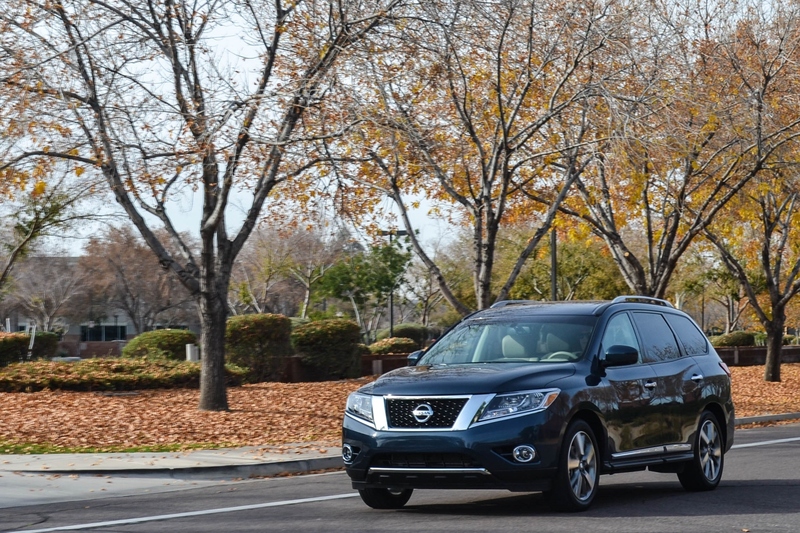 The overall body style is fairly Plain Jane; but there are a few stylish features that help the Pathfinder stand out. Chrome trim is well layout through the front fascia, side-body moldings and rear bumper; as an added bonus against the Blue paint it looks pretty darn good. Add the Platinum badge, standard 18” wheels gets upgraded to 20” machined finish alloy wheels that fills in the wheel wells nicely. And to top it off, the silver roof rails adds that attractive SUV look. The new Pathfinder has gotten much bigger gaining nearly 5” in length and 4.5” in width which goes to show in interior capacity. Laced in perforated Almond Leather the Pathfinder is designed to seat 7-passengers in comfort. Whether you’re behind the wheel or a passenger in the 3rd row, every seat is the best seat in the house. Driver and front passengers can relax in full comfort from the dual-zone climate control to the heated & cooled seats. The driver can find a comfortable sitting position through the 8-way power adjustments while the passenger can also find relaxation in the 4-way power adjustable seat. The sliding 2nd row is the place to be a passenger; on cold mornings you can warm up with the rear automatic climate control, heated surfaces and a 3-way reclining position. The optional $2,300 Platinum Premium Package makes traveling much more gratifying with a Panoramic moon roof and dual 7” headrest entertainment system. 3rd row passengers on the other hand, they can just be happy that a full size adult can fit comfortably for more than a one mile journey. As part of the Platinum trim, this Pathfinder came equipped with an 8” touch screen Navigation system that’s set inside a matching almond dash with faux wood accents garnished with painted silver trim. Included with the Navigation you can enjoy Around View Monitoring (Back-up Camera), Sirius XM Radio, Live Traffic, Live Weather, and Bose surround sound system with 13 speakers & sub-woofers. All of this is great; however, even though the Navigation wasn’t difficult to use, it had a ton of sub-menus when entering a destination – which made it distracting while driving and time consuming when stopped. I had difficulty working the Bluetooth system and the steering wheel controls were awkwardly laid. The Pathfinder was loaded up with tons storage and hidden compartments. At the front, slots are built into the center console that can fit maps, iPads, or coloring books for the kids and has a generous center console split storage compartment. Work your way to the trunk and you might find some hidden treasure in the secret storage compartment under the floor. One of the best things about the Pathfinder is even with the 3rd row up you still have clear rear window visibility and a decent amount of rear cargo room for your everyday shopping journeys. The 50/50 split 3rd row seats and 40/60 split 2nd row seats fold flat for more than generous cargo area. Nissan swapped out the old 4.0L V6 with a new 3.5-liter V6 that emits 260 horsepower and 240lb-ft of torque. Our Pathfinder was not equipped with the optional 4WD, so power was delivered to the front wheels through a CVT. Weighing just over 4,300lbs it pulled out a fairly decent acceleration time of roughly 8 seconds to 60mph. The CVT engine is astonishingly good – not surprising from Nissan; acceleration is extremely smooth and powerful. Put the power down, the engine will put out quite a good tune. For those moment’s you decide to get away from the city life for the weekend and need to tow, let say a camper trailer, the Pathfinder can tow upwards to 5,000lbs. For an SUV, it was easy to maneuver about. It is quite large, narrow streets and tight parking spots were somewhat difficult to navigate, but when it came to handling the Pathfinder was actually fairly decent. The steering was not too light or too stiff which made it great for moving around the city and curved highways. It also didn’t wobble about when turns got intense; the suspension kept the Pathfinder smooth and well balanced. Though when things got too harry; the 4-wheel anti-lock disc brakes were quite good when needing to make a hasty stop. Cruising down the road on 20” alloy’s the suspension system provided the utmost smoothest ride you can ever expect from an SUV. If by chance you find yourself down a paved dirt road you would never notice. Road and wind noise is completely unnoticeable even at speeds of 80 mph. What is noticeable is the fuel economy. Trucking through the city limits I averaged 19mpg and on the open highway a lousy 23mpg making for a combined average of 20.2mpg overall. Using Unleaded Plus fuel; the 19.5 gallon fuel tank barely emptied my wallet at $50 and a range of 370 miles. Driving this Pathfinder; I wanted to hate it. But it was like watching your kid graduate from college, leap out into the world and start a family. The styling may be a bit on the conservative side, but I think it will age well overtime along with your family. It may no longer be that adventure seeking SUV, but has turned into a good family voyage.